Length: approx. 7 km total, Time, approx 3-4 hrs (+/- 400 metres of climb/descent). Yellow marks and well signposted throughout. Some steep climbs and rocky ledges, so a stick and stout boots or shoes are advised. Map reference IGN 2549OT 31N 498730E 4708000N. 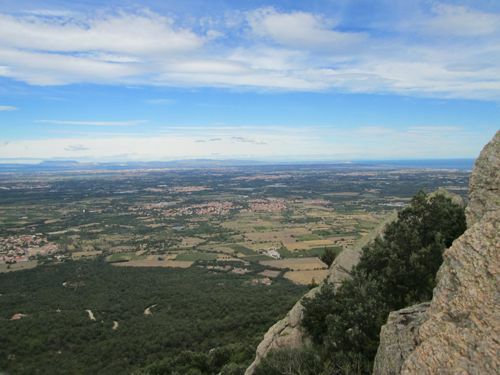 This walk starts and ends on the road to La Vall, between Sorède and Argeles, and after meandering through the lower wooded slopes climbs steeply up to the ruggedly impressive Château d’Ultrera –the Castle of the Vultures! Park at a bend on the road, just at the start of the path heading south to the charming little Chapelle de la Pavé which dates from the Xth – XIth century. There was actually a village here at that time, but over many years the village disappeared leaving only the chapel, now dedicated to St Ferréol. Signposts on the path indicate the walking time to the top, but these are ridiculously optimistic unless you are an Olympic athlete, so take your time, enjoy the fantastic views and take plenty of water and a picnic. After pausing at the Chapel, continue west up the forested path approx. 500 metres to emerge onto a track (498730E 4707620N). Fork left up onto a rocky ledge (also signposted) and climb another 200m before you reach a tree-shaded well, built into the hillside next to a massive boulder. The water looks very clean, certainly the frogs living in it agreed! Continue west up through the woods. Each time you emerge from the trees you can catch glimpses of the coast to the east or down to the Chapel below. A few hundred metres of fairly steep climb, and you reach the north-south ridge leading up to the Château. 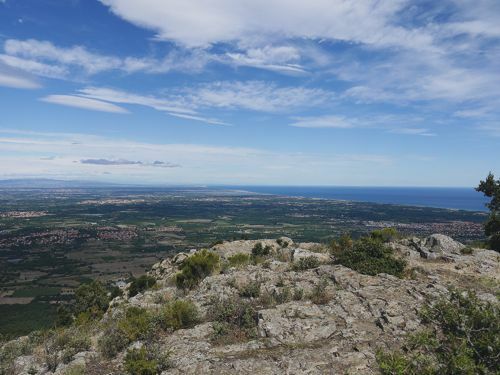 From here you can see from Canigou in the west to Port Argeles in the east with the entire plain of Roussillon in between. The higher you go the better the views, Sorède and St Andre appearing as pretty little model villages below. The path snakes south up the ridge with some tricky rock slopes to conquer, adding to the sense of adventure. 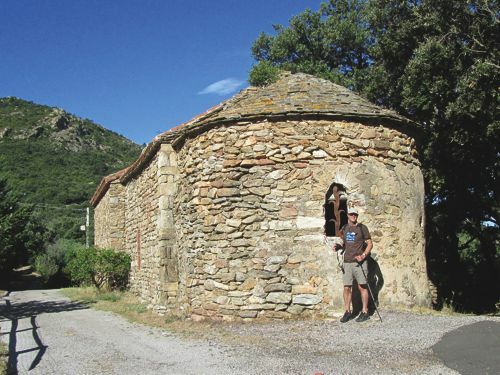 At the Puig de Sant Miguel at 430 m elevation, pass through an archaeological dig on private land, where for the last 13 years specialists have been searching the ruins which were inhabited from the Vth to the Xth century. To the right as you near the top you can see the Hermitage and just below it the chapel of “Notre Dame du Château”. 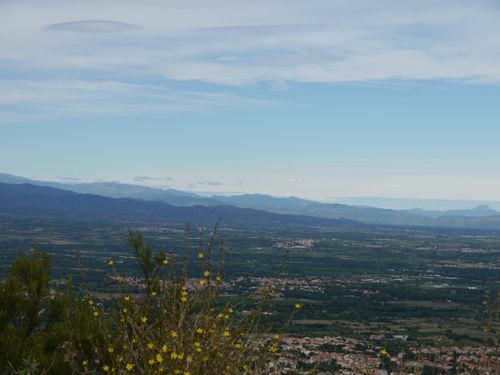 To finally reach the Château d’Ultrera at 498270E 4707010N, pass around the south side of the rocky peak, and climb to the top to enjoy the 360 degree commanding views of the Vallée de la Massane, the plain of Roussillon and the Littoral. There is a very long history here, beginning in Roman times, continuing with the Visigoths in the VIth and VIIth until relatively recently in the XVIIth century, when the castle was destroyed to prevent the Catalans using it against the new French rulers of the Roussillon. Sadly there is not much left standing, but the outlines of some buildings and walls are still perched precariously on the craggy peak. After enjoying a rest and a picnic amongst the fantastic scenery if the winter weather is kind enough, carefully retrace your steps down to your start point, and reward yourself by heading home for a well-earned apero.